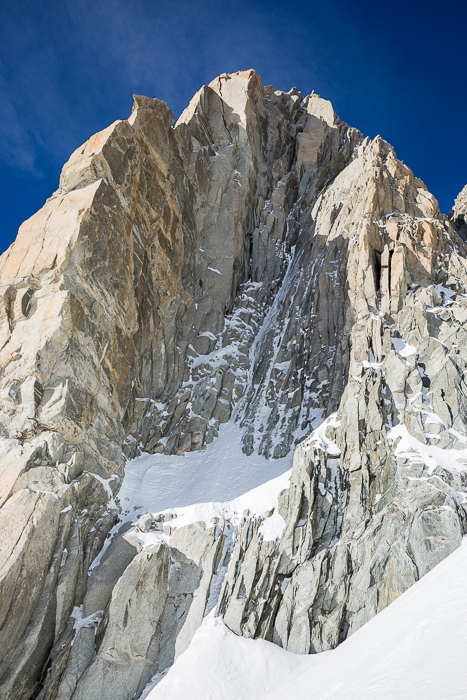 Earlier this week, Alex and I set off to attempt a route called Tentation, a little known mixed line on Pointe Lachenal put up by Jon Bracey and Nick Bullock in the winter of 2006-07. Below is my account of our battle up their line. In homage to Nick’s original trip report (click here), the account is light on useful route-finding beta but high on charged-up emotion! The bottom half of the line. It takes the obvious ice groove then continues directly up via some challenging mixed. I look up at the route and the damage the warm summer has wreaked on the mountains is strikingly clear. The snow line is a good 10m lower than in our topo and rather than a simple snow slope to warm up on I get stuck straight into a mixed chimney. Shallow hooks and dubious torques lead me up. It’s all there but feels tenuous and I’m grateful for the good gear on my left. Exiting the chimney I march up the snow slope and enter the goulotte proper. Perfect névé lines the back of the gully and progress is easy. We run out of rope and I make a belay. The climbing ahead looks harder and part of me is glad it’s Alex’s lead next. Alex sets off. At first it’s more of the same. Good ice, good gear. Then the ice begins to disappear and soon all that’s left is a thin smear. Axes must be aimed carefully. We dare not pull too hard to test them. Alex reaches a junction. The climbing above looks harder and Alex shouts down to ask how much rope. 30m I respond. He better not build a belay, I think. Mercifully he doesn’t. He checks the topo to try and be sure of the line. Looks like it’s right but it’s hard to say for sure. Off he goes. Physical torques lead higher. A flake, just a few millimetres thick, expands alarmingly but miraculously doesn’t blow. Legs stretched wide, at full length’s reach a small blob of detached ice is gained. Thinking light thoughts, pull up to find a good hook. Relief washes over. Would I have had the balls to do the moves on lead? The climbing doesn’t ease off. Pumpy laybacking takes us higher, the occasional good foot placement providing much needed rest. Just before the belay the crack that’s allowed upward progress peters out to nothing. Locking off the left tool, a lunge gains a deep hook on the right and with it the safety of the belay. Straight above us is a stunning corner crack. Looks amazing, but hard. We check our topo. Seems like Bracey and Bullock also saw the corner but chose to traverse right. Not fancying our odds with the direct line, we keep to their original route. I start moving right over a delicate slab. The tool placements are rubbish. Shallow, flared cracks and wobbly side-pulls. I search around for something, anything. I find a thin seem of soil which just barely takes the tip of my pick. It’s laughably bad and I dare not pull on it. I focus on my feet, precisely placing my frontpoints. A few metres later I gain the right edge of the slab and start working my way up. From below, things don’t look too bad. Moderate-angled and plenty of flakes to hook. It’s deceptive though. Every flake expands and leaves no doubt what will happen if my feet skate off. The flakes disappear and I’m forced to pull on tools placed in loose soil. My picks start to slice through the soft turf but just manage to hold. Eventually I find some ice and the climbing eases. I build a belay and check our topo. Just a bit of Scottish 5 then a pitch of Scottish 6. Looks like the worst is behind us. With a few hours until darkness I start to think we might just make it. Alex leads off taking the line of least resistance. He moves quickly at first and I try to stop myself from thinking the route is in the bag. After 30m he slows. What’s wrong. A short while later I find out for myself. What looks like the obvious line is barred by a slab coated in a thin veneer of ice. It won’t hold a tool placement and so instead we traverse right. Axes torqued into the back of a crack, crampons smeared on smooth granite, I try not to think of the massive pendulum I’ll take if I fall. Finishing the traverse, a couple of steep steps lead to the belay. A slab leads to a series of steep cracks. I choose one on the left. It looks steeper than the others – at first vertical then overhanging – but it’s a bit shorter and I hope I can just power through. I place a cam, clip a peg then go for it. Instantly I’m shocked by the difficulty. There’s nothing for the feet and whilst the hooks are all there a deep lock off is needed to go from one to the next. It feels like sport dry tooling, not mountain mixed. The only difference is there’s no bomber bolt by my side to clip. I feel the burn in the arms, but keep climbing higher, lunging for each successive hook. I face a dilemma: to place gear, but risk pumping out, or to run it out and hope I can reach the top before my arms give way. I run it out. Pulling up higher, the feet become desperate. I find myself at the bulge. Just a move or two and I’ll be done. My left axe hooked in a crack, my feet on nothing, I swing with my right axe but find only soft snow over the lip. One of my feet pops and I fall onto my left axe. The burn intensifies. I lock off my left axe, again desperately searching for something with my right. There’s nothing. A foot pops off for the second time and I slump onto my axe, barely managing to hold on. I’m pumped out of my mind and know I can’t hold a third fall. I become acutely conscious I’m well above my last piece of gear. It’s fight or flight time. I chose flight. I scream down to Alex to take the rope tight and with my last ounce of energy try to downclimb a metre or two to limit the fall. A couple of moves later and I can hold on no longer. Involuntarily I let go of my axes, but to my surprise fall just half a metre. Looking up I see one of my axes hooked in a crack, the leash that attaches it to me stretched tight. A moment’s rest and I try once more. This time I place gear. My arms are wasted from the first attempt and as soon as I get a piece in I’m forced to rest on the rope. I try a few more times to surmount the overhang, but each attempt is worse than the last. Scottish 6 my arse. We’re clearly off route. Free climbing ethics go out the window and I try every trick in the book. Pulling on a cam, stepping in a sling. Finally I find a small spike to hook and I haul myself myself over the bulge, collapsing into the snow exhausted. I continue on upwards. Mercifully the climbing is easier, but with nothing left in my arms it feels brutal. In the fading light, I can just make out the summit. There’s only five metres of steep mixed separating me from it. I struggle to find the mental reserves to commit myself to this final wall and desperately want to stop and build a belay. Putting aside these thoughts, I place a cam and go for it. Again the feet are awful, but thankfully the climbing is just off vertical. Furiously pulling hook to hook, sparks flashing in the dark as my crampons skate on the granite, I pull myself up just before my arms give out. I build a belay and a moment later shout “safe” to Alex. Never have I been so relieved to say this simple word. A little while later Alex battles over the final wall and joins me at the summit. I turn to him, “so what did you think? Hard, ey?” Alex looks up at me, “hard!? That was savage!”. Thank you Mr Bracey and Mr Bullock. We came looking for high quality, challenging mixed and you more than delivered!